Sculpture by the Sea was the brainchild of David Handley, who had the idea of creating a major ‘free-to-the-public’ arts event for Sydney. As a fan of large community events such as ‘Opera in the Park’ and ‘Symphony under the Stars’, he loved the way that total strangers came together as a community to appreciate music while enjoying a picnic and a glass of wine. With this kind of collaborative spirit in mind, he began to see the need for some form of accessible visual arts event in Sydney, despite the fact that he didn’t come from a visual arts background at all. During a sojourn in Prague, Handley visited an outdoor sculpture park near Klatovy in northern Bohemia. The park, which was set among 13th century ruins, gave him his first powerful experience of sculpture, and sewed the germ of an idea that was later to become Sculpture by the Sea. After his return to Sydney in 1996, a walk along the coastal path from Bondi to Tamarama gave him further inspiration as he envisaged installing all kinds of sculptures on the natural stone plinths which jutted out into the sea. With the help of a number people, including Anita Johnston from Waverley Council and renowned sculptor Ron Robertson-Swann, he set about turning his dream into reality. While financing was initially a big problem, with the help of many volunteers his idea began to take form and within a short while they managed to attract over 100 artist submissions, together with media interest, council approval and a major sponsor. The first exhibition was ready to open within 10 weeks although, due to the lack of a budget for security, it was limited to a one day show. Over 25,000 people came to see the artwork exhibited in that first show in 1997, proving that the idea had considerable merit and the potential to be an ongoing event. 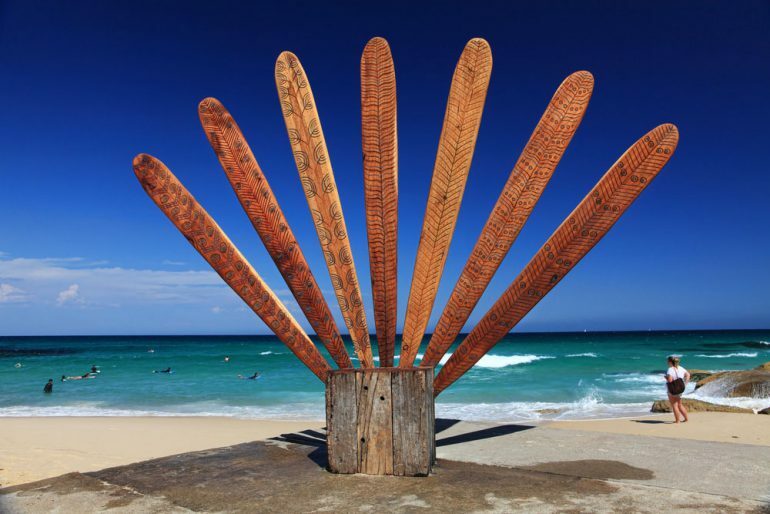 In 1998, the Sydney Organising Committee for the Olympic Games commissioned five Sculpture by the Sea exhibitions for the 1998 Olympic Arts Festival, with over 260 sculptures exhibited in Darwen, Noosa, Albany, Bondi and the Tasman Peninsula. While Handley would have loved to keep all these exhibitions going, unfortunately it was not financially viable. However, the idea has since grown with the exhibition in Bondi now extending to over three weeks. They have also been able to offer increased support to the artists in the form of awards and subsidies, develop ties with overseas sculpture organisations, and develop the exhibition’s sales, which reached the grand sum of over $1 million in 2007. Furthermore, Sculpture by the Sea has also developed a school education program, which attracted over 1,600 students in 2007. In 2005, Sculpture by the Sea – Cottesloe was launched, an annual event which is held on the beautiful Cottesloe Beach in Perth, where the sculptures are displayed against a stunning backdrop of beach and sunsets. With the continued success of Sculpture by the Sea – Bondi, hundreds of artists submit applications to have their work featured in each year’s exhibition, and this year has been no exception with over 500 submissions from 14 different countries being received. In 2015 you can expect to find over 100 sculptures by both national and international top artists as well as emerging talent transforming the coastal walk from Bondi to Tamarama. It’s estimated that over 500,000 people will come to see the temporary sculpture park to admire the work on show for its 10 day duration at Bondi. The 19th annual Sculpture by the Sea – Bondi will run from 22nd October to 8th November 2015, so make sure you put the dates in your diary. And don’t forget that the work is available to purchase; you could have a sculpture that’s been seen by almost half a million people taking up residence at your property. Sculpture by the Sea – Cottesloe also continues to attract interest from artists far and wide. This year visitors to Sculpture by the Sea – Cottesloe were treated to work from 23 artists representing 9 international countries, including China, Denmark, England, Hong Kong, Japan, New Zealand, Czech Republic, Thailand and the USA, during the 11th annual exhibition held in March. Of course, there were also exhibits from a multitude of Australian artists too, with work adorning the beautiful Cottesloe Beach together with Sculpture Inside, an indoor exhibition of artwork by emerging, mid-career and established Australian and international artists. Next year, Sculpture by the Sea in Sydney will celebrate its 20th anniversary, so expect lots of celebrations. Now an institution in the Australian calendar, from small beginnings it’s grown to a multi-million dollar affair which attracts half a million visitors a year to its 10 day show at Bondi.